In his first interview since joining Apple, industrial designer Marc Newson discusses his latest product – a domestic draft beer machine he says is the equivalent to a Nespresso coffee maker for beer lovers – and the future of the mechanical timepiece in the wake of the Apple Watch (+ interview + slideshow). 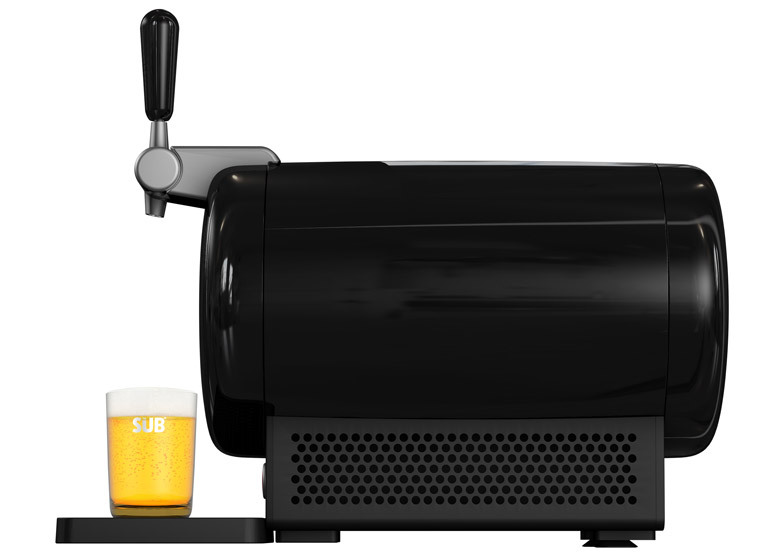 Newson, who described himself as a "consistent beer drinker", collaborated with Dutch brewing company Heineken and technology company Krups to produce a draft beer machine designed for use in the home called The Sub. "This is a brand new experience, it's a brand new type of object," Newson told Dezeen. "The obvious and easy analogy would be Nespresso." "This will make available all different types of brands of beer around the world to people who would otherwise never be able to experience them. And if they could experience them they would be in a bottle or can, certainly not in a draft format. It's really a kind of revolutionary shift in terms of this particular product." 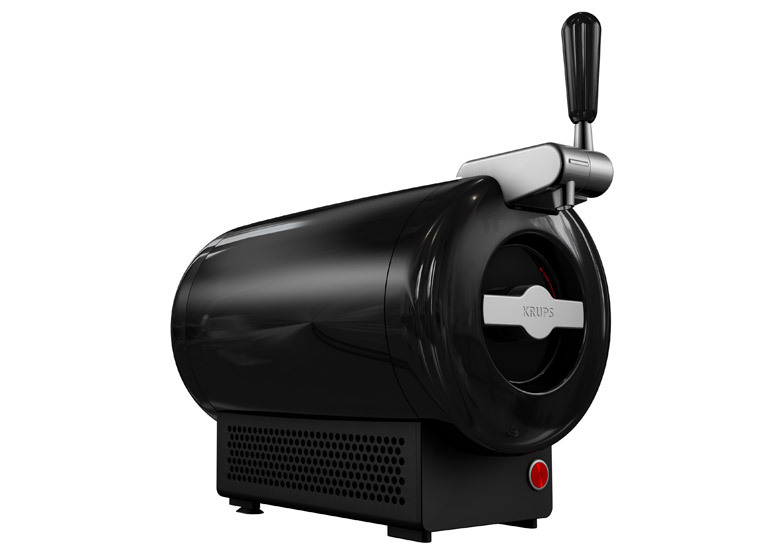 The 41-centimetre-tall machine is shaped like a small metal beer cask, with a tap at one end. This sits on a base with mesh sides and a large red button at the front to turn the device on. 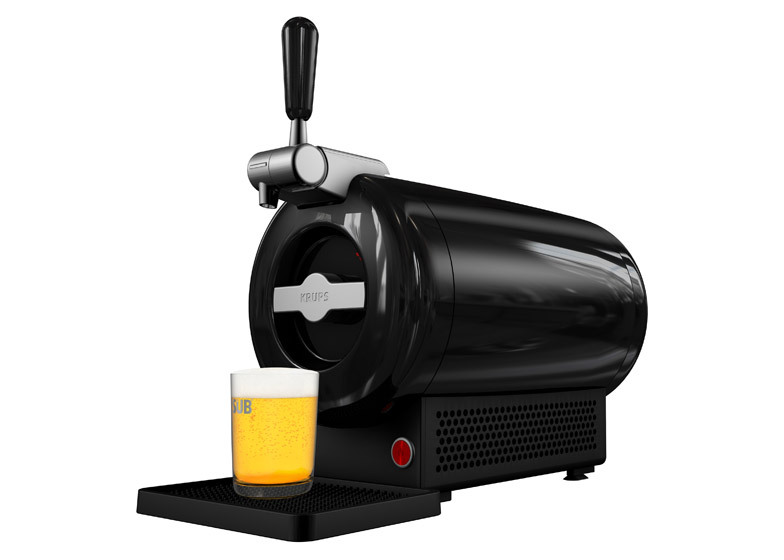 It can be filled with pressurised modules that hold two litres of beer, called Torps, that can be ordered to contain a number of different types of brew from Heineken's collection of brands. These are inserted horizontally into a circular compartment in the centre of the machine. A handle on the front twists to open and re-seal the device. Newson said that he wanted to include familiar visual cues surrounding the sale and manufacturing of beer in the design, meaning its round shape and tap pouring system were chosen for aesthetic rather than practical purposes. "It's not only about beer, it's also about the greater experience of drinking beer," he explained. "Of course we want this object to look good, but this is not something that we wanted people to have to endure in order to have fresh beer." The Sub will enable home drinkers to pour themselves the exact amount of their preferred beverage they require, rather than having to consume quantities determined by the size of available cans or bottles, said Newson. "My wife for example, who loves beer, doesn't ever drink a whole can of it. Half a can will sit there, get warm and get thrown out," he said. "This enables you to have any amount of beer, you could have a thimble full if you wanted and it would be as good as a big glass." The design is a development from a similar product launched by Heineken 10 years ago, and is initially launching in a silver aluminium version this autumn. An all-black edition will also be available in France and Italy from today. Newson announced he was joining technology giant Apple last month shortly before the launch of the Apple Watch, which a number of commentators have said bears a strong resemblance to Newson's own watch designs. Asked if he could reveal whether he was involved in the Apple Watch design, Newson responded: "Apparently I can't". But he did not think the mechanical watch industry would be significantly affected by the device. "The mechanical watch industry will continue to exist in much the same way as it does right now," he said. Earlier this month, before the Apple Watch was launched, Apple's vice president of industrial design Jonathan Ive reportedly said that the gadget would cause problem’s for Switzerland’s watch industry. However Newson said: "There will always be a place for mechanical watches. Apart from telling the time – which is all they do – they're about something completely different." Visit our Dezeen Watch Store blog for more on Newson's comments on the watch industry. Amy Frearson: Marc, could tell me a little bit more about the product? 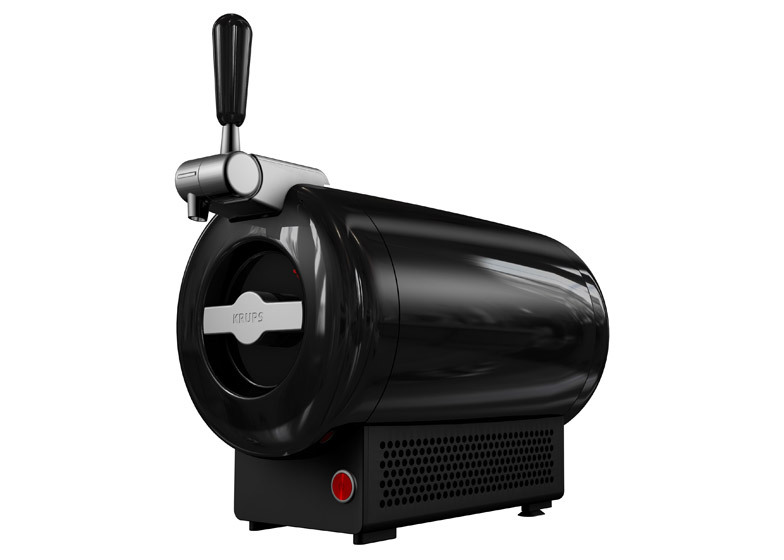 Marc Newson: Basically this is a machine that delivers draft beer, but it's designed specifically to be used in a domestic environment. It was obviously of the utmost importance that this thing looked as good as it possibly could because it's not the kind of thing we wanted to chuck away and hide. The design is really the result of very many technical parameters, this is a complex mechanical object. Indeed it is a complex electronic object that has to deal with things like temperature and the pressure that exists in the refills, which are called Torps. So yeah it's doing a lot of things, this object, in order to deliver draft beer. And I guess you may ask "what's the point?" and the point is that draft beer is fundamentally for people that like beer and drink beer, and who know that draft beer is far superior to beer that you will get in a can or a bottle. Amy Frearson: What's unique about this product, as opposed to others on the market? Marc Newson: Well there really aren't any products that do the same thing, that's the point. Heineken have decided to really create a new category of products here. About a decade ago Heineken had a similar product that was very different in many ways – it certainly wasn't designed with the same functionality and the same flexibility in mind. So this is a brand new experience, it's a brand new type of object. The obvious and easy analogy would be Nespresso. This will make available all different types of brands of beer around the world to people who would otherwise never be able to experience them. And if they could experience them they would be in a bottle or can, certainly not in a draft format. It's really a kind of revolutionary shift in terms of this particular product. Mark van Iterson: In beer around a century ago it was still you went with your jar to your pub around the corner and it was filled from a draft keg and you took it home and you had to drink it immediately. Then Heineken was at the forefront of putting lager beer in a bottle with an expiry date of a couple of weeks, so you could take it home. That business model of beer in cans and bottles was exported all around the world. This has basically changed over the past 100 years but we know that draft beer, because of the C02 structure and the foam, is the best taste experience. 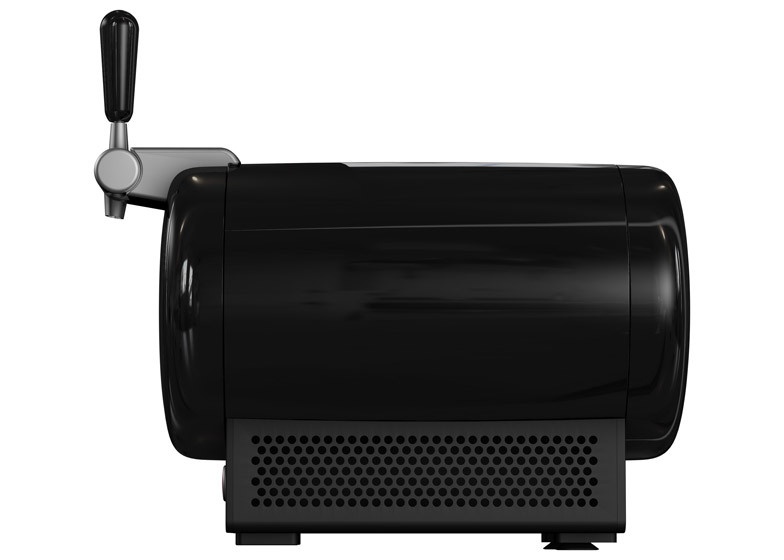 So we strongly believe that this might be for this century one of the next shifts in beerland – to get draft beer into people's homes. We started this innovation 10 years ago, and this one incorporates all the learnings from that and it's the real next generation. In our brief one of the key elements was to try and give this new category a face. Something that's recognisable, that has a clarity and simplicity in shape, in everything, it expresses quality. We lead this with the Heineken brand but we own like 250 brands and products and beers, many of these are already – and will become – available as Torps to go into this machine. We have in front of us, for example, a beautiful beer from Italy. You cannot buy it here in Holland, but in a Torp you can. You just order it and get it delivered. When we launch next year in the UK you will be able to order a Dutch Weissen beer which you could usually never buy in London. So it's a whole eco-system that we designed around it and will enhance the home beer experience. Amy Frearson: Marc, was it important to you that this thing looked familiar, like something you would see in a pub? Marc Newson: Absolutely. It had to look and function in an appropriate way. I didn't want to design an object which didn't on some level use recognisable vocabulary. It's not only about beer, it's also about the greater experience of drinking beer. 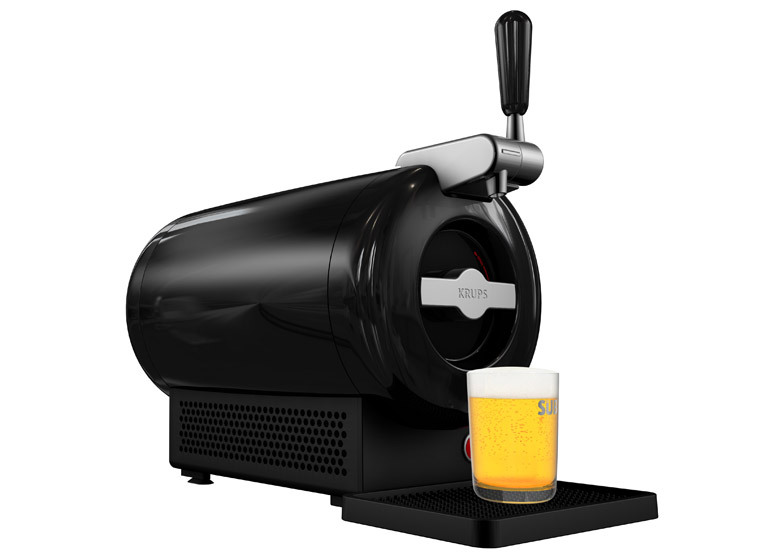 Of course we want this object to look good, but this is not something that we wanted people to have to endure in order to have fresh beer. On a fundamental level it's cylindrical, that's probably the most recognisable design cue – beer is manufactured in cylindrical containers and it's generally sold in cylindrical containers so the whole vocabulary of the cylinder is integral to the design. It has something which is effectively a tap, the kind of tap that you would see in a pub, so that's another really obvious cue. None of these things had to be this way, we wanted them to be this way. Mark van Iterson: And it's designed all around, from 360 degrees it looks good. There's a front because of its functionality, whether you put it in your kitchen or dining room, it should look good from all angles. Amy Frearson: And Marc Newson, are you much of a beer drinker yourself? Marc Newson: I'm a consistent beer drinker, put it that way. And that's one of the great things about this machine. If I'm at home I'll probably have a beer after work. And if this machine enables me to do that I might not even feel like a whole can of beer. In fact my wife for example, who loves beer, doesn't ever drink a whole can of it. Half a can will sit there, get warm and get thrown out. And this enables you to have any amount of beer, you could have a thimble full if you wanted and it would be as good as a big glass. I can have a small beer if I want and it doesn't change anything in terms of the experience. I could also put all sorts of different beers in that I would otherwise never be able to get access to. Amy Frearson: So how did Heineken get you on board with this project? Mark van Iterson: This is a really special project, you can imagine it's a big innovation and it's a big investment. We thought that Marc's approach and visual language felt very appropriate. We immediately had the idea and feeling that he would himself be completely involved in understanding all the details down to the production. In the end it's a craft and comes down to craftsmanship and understanding how to get it exactly right, while many other big designers work with huge studios and are hardly themselves ever involved, so we thought "here we have someone who is versatile and who can understand technology and how this in the end really works", so that's why we asked him if he could do this for us. Amy Frearson: And Marc, what made you decide to get involved in this project? Marc Newson: It was quite a tough project, especially given that there aren't really many other things like this. We're all really happy with the result and there's going to be a lot of these things so it had to be really really well thought out, well engineered. Mark van Iterson: We also selected Marc because we saw that he is very demanding in what the final product looks and feels like, and its final functions. We wanted rather an accessible price point, so this machine is costing €249. Many people can afford that. But then in production and scaling up, trying not to compromise and really keep on working towards that quality level that we wanted, you can imagine it's easier to do that if the machine can cost €2,500 in the end. To do it for this price, that's a real beautiful balancing act and that requires a lot of creativity and inventiveness. Amy Frearson: Marc it seems like you've had a go at designing just about everything – is there anything else you haven't designed that you'd like to try? Marc Newson: I always get asked that question and always struggle to find an answer to that. You know, I don't really have a checklist of objects. I'm really happy to design anything because, fundamentally, for me there isn't really a big difference between designing a watch or a car or even a machine that pours beer. These are all on some level mechanical bits of engineering that differ only in the materials that they're made from and the scale. All of these objects have really specific requirements and you've just kind of got to understand that and then it becomes a problem-solving exercise. Amy Frearson: You've taken on quite a major role with Apple, do you think you'll still have time to work on these kinds of project as well? Marc Newson: Yes absolutely, because my role at Apple doesn't necessitate all of my time and that was for very specific reasons, so absolutely, my company still exists and I remain based in the UK. Amy Frearson: And can you tell me what you're working on at Apple? Marc Newson: Not really! Sorry! Mark van Iterson: They'll fire him immediately if he does. Marc Newson: And I've only just started! Amy Frearson: Can you tell me if you were involved in the watch design? Marc Newson: Apparently I can't. Victoria Wood (PR): Sorry we can't answer that, sorry. Amy Frearson: Maybe I could ask you another question. With your background in watch design, can you tell me what you think is the future of the traditional watch? Marc Newson: There will always be a place for mechanical watches. Apart from telling the time – which is all they do – they're about something completely different. You know, I think that the mechanical watch industry will continue to exist in much the same way as it does right now. To be honest I'm not really intimately aware of what's happening with the world of mechanical watches right now. Mark van Iterson: We have two wrists – one doesn't exclude the other! Marc Newson: Absolutely. But I'm sure as sales have increased in recent times, they will continue to increase for that particular type of product.